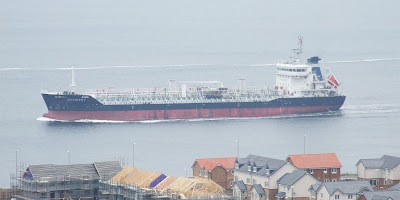 Seen yesterday afternoon passing the new housing being built on the former Lithgow shipyard at Port Glasgow, was the new tanker ARTISTRY as she made her way downriver from Rothesay Dock, en route to Rotterdam. ARTISTRY, which is operated by the Singapore company Hong Lam Marine, was constructed by the Yangzhou Kejin Shipyard Co in China, and delivered to her owners in May this year. She is 9,040 tonnes deadweight, and her overall length is 110 metres. Her crew are mainly Indonesian.